Plant Systematics, Second Edition, provides the basis for teaching an introduction to the morphology, evolution, and classification of land plants. It presents a foundation of the approach, methods, research goals, evidence, and terminology of plant systematics, along with the most recent knowledge of evolutionary relationships of plants and practical information vital to the field. This updated edition has been expanded to include 15 fern families, 9 gymnosperm families, and increased angiosperm family treatments from 100 to 129. Each family description includes a plate of full color photographs, illustrating exemplars of the group along with dissected and labeled material to show diagnostic features. 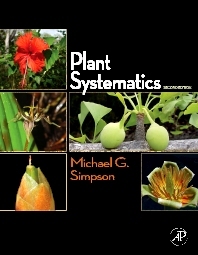 The book includes a new chapter on species concepts and the role and impact of plant systematics in conservation biology, and a new appendix on statistical and morphometric techniques in plant systematics. It also contains more detailed explanations of maximum likelihood and Bayesian phylogeny inference methods, an expanded coverage and glossary of morphological terms, and an updated chapter on botanical nomenclature. This book is recommended for graduate and undergraduate students in botany, plant taxonomy, plant systematics, plant pathology, plant anatomy, and ecology as well as scientists and researchers in any of the plant sciences. Dr. Michael G. Simpson has been a professor of Biology at San Diego State University since 1986. His area of expertise is plant systematics, dealing with the description, identification, naming and classification of plants with the overriding goal of inferring the pattern of evolutionary history (phylogeny). Dr. Simpson has taught courses in Principles of Organismal Biology, Plant Systematics, Taxonomy of California Plants, Economic Botany, Genetics and Evolution, and Seminar in Systematics and Evolution. Additionally, he serves as the Curator of the SDSU Herbarium where he oversees the maintenance, organization, and use of the collection and facilitates additions to the herbarium. Currently, his field work in Chile and Argentina is supported in part by the National Geographic Society. I got this to replace my 1976 Vascular Plant Systematics. This text is thorough, clear, (quite a bit of technical terminology), and has a logical progression. In-depth discussions on taxonomy, evolution of plants, genetics, plant morphology/terminology, and many descriptions of plant families and orders. I have read about a third of the book and look forward to spending more time with it.